Dimensions (HxWxD): 2.33" x 1.2" x .6"
This magnificent museum-quality sterling silver hand-carved Buddha Gau Box altar/pendant, weighing 1 ounce, and standing 2 inches tall, comes complete with an 18 inch sterling silver chain in its own jewelry box for safekeeping. The Gau box is a traditional Buddhist pendant that functions as a portable altar, a container for a small statue of a Deity or Buddha or Boddhisattva, and a container for prayers. The Gau box traditionally is used to store tiny pieces of paper containing written prayers or sacred diagrams or mandalas, called yantras. Place your own prayers, affirmations, tiny pictures, mantras or yantra in the Gau Box as part of your spiritual practice. Because the Gau box is worn as a pendant, the Gaus are made of metal and often ornamented with crystals or precious stones. You can also place small gemstones, crystals, dried flowers and other power objects within the Gau Box as part of your person empowerment. 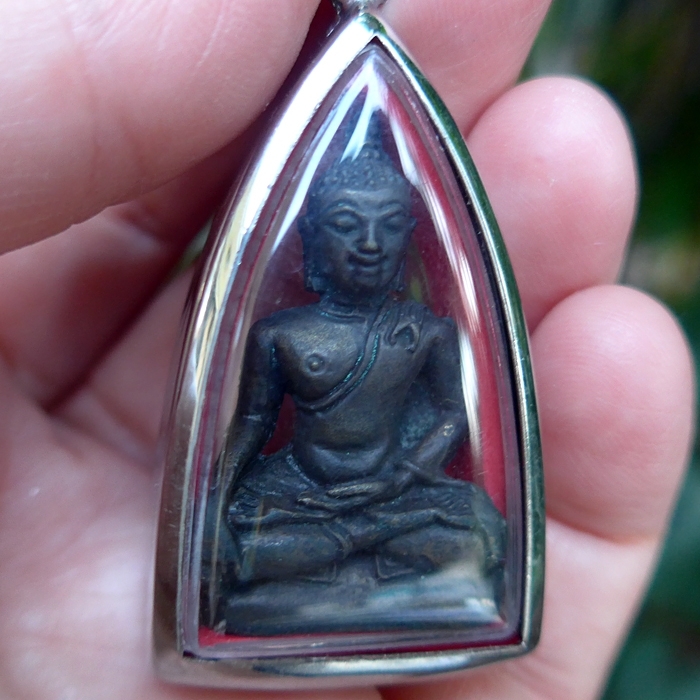 This Buddha amulet was blessed by Buddhist priests in Thailand and set into a stainless steel case for safe keeping. It can be worn on the body or placed upon an altar for distributed blessings. 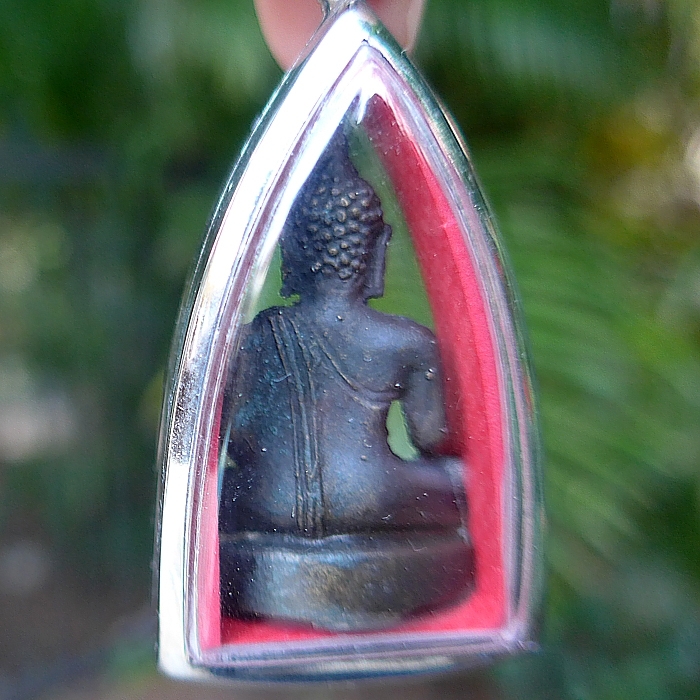 I was told by the vendor, who lives in Thailand and California, that this piece was blessed by a Thai Buddhist priest who was connected with his Thai wife's family for many generations. If nothing else, this piece is a lovely example of temple carvings depicting the Buddha. Wear it or use it in good health. Let it serve you for proctection and connection with Universal Love. 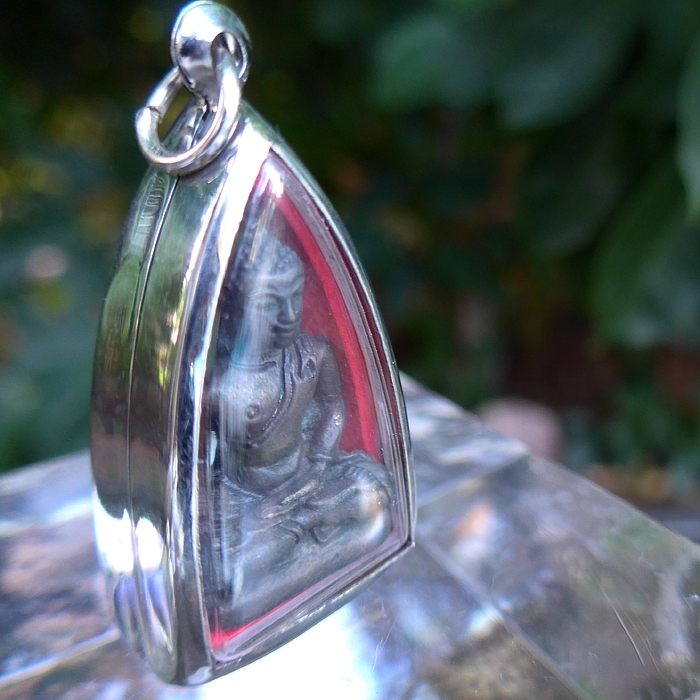 This unique, one-of-a-kind gemstone Buddha Gau Box altar/pendant is both an energetically powerful Buddhist treasure and a truly world-class collector's item, ready to elevate the energy signature of your environment and invoke the Spirit of the Buddha. This pendant has been cleaned with Universal Life Force Energy, and given an energy attunement using Reiki, a Japanese technique of energy healing, so it will continue to receive and transmit Universal Life Force Energy direct from the Source of Creation. It has also been cleaned and charged with the natural energy of sunlight. It is ready for you to program according to your own needs and desires. Weight above is shipping weight. Net weight is 28.4 grams or 1 ounce.